Funny how things work in the world of government. Just as 2014 is about to give up the ghost, the salary and benefits information from 2013 becomes available. Speedy isn't quite the middle name of government. Or if it is they really should give it up because there are others who are far more deserving of that moniker. As you might recall, the last time Robert Fellner and our friends at Transparent California revealed this kind of information, and for every possible form of government agency in California (think of the sheer immensity of such a project! ), the big news that shook our small but lively corner of the creation was that Sierra Madre in 2012 had been handing out perhaps the largest health care benefit packages of any city in the entire state. In certain cases we're talking as high as $37,000 an employee per year. What someone would actually get for that kind of money still baffles me. I'm assuming Medevac service would have to be standard. The timing of these Sierra Madre revelations couldn't have been better as far as our elections last April were concerned. After having spent the previous few years listening to the city claim that every excess and unnecessary expense had been (to use their term) "cut to the bone," Transparent California supplied us with proof of City Hall budgetary excesses so outrageous that it turned the politics of this town on its head. The defeat of this city's UUT tax increase ballot initiative last April (by the very slimmest of margins) would never have happened had Transparent California not uncovered proof that City Hall's claims of stringent financial frugality just were not credible. The good news is that in 2013 the City of Sierra Madre cut the costs of those extremely expensive health care packages a bit, and when we eventually see the 2014 numbers a year from now they will be even lower still. That is when the effects of the reforms put in place by Denise Delmar and Rachelle Arizmendi start to kick in. More proof that true transparency has become the taxpayer's best friend in Sierra Madre. 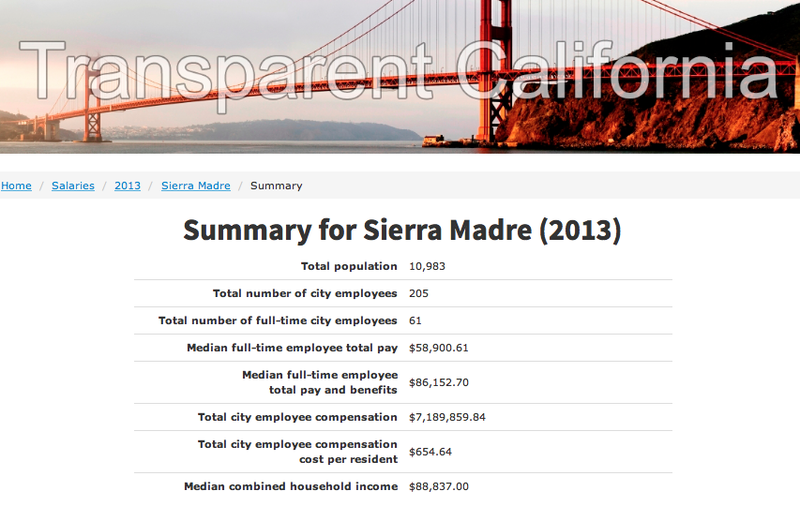 You can access Sierra Madre's 2013 numbers by clicking here. This year's big revelations have to do with the City of Los Angeles. 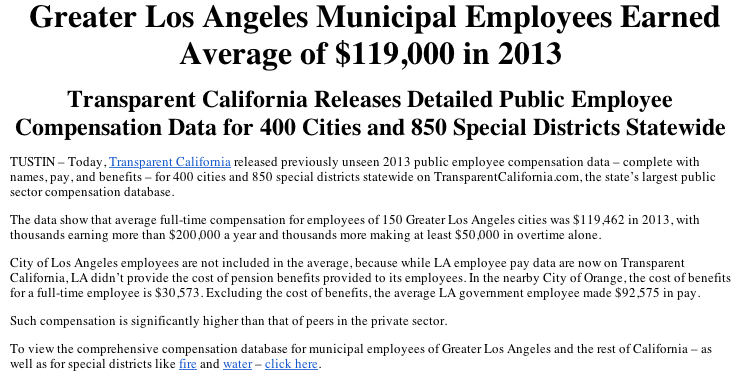 As you will see when you read the following announcement of their release of the 2013 salary and benefits data on the Transparent California website, L.A. is making millionaires out of a lot of its city employees. To link to the Transparent California site please click here. To link to the California Policy Center website click here. We'll be digging out a few more Sierra Madre revelations after we've had a little more time to go through the numbers a little bit. 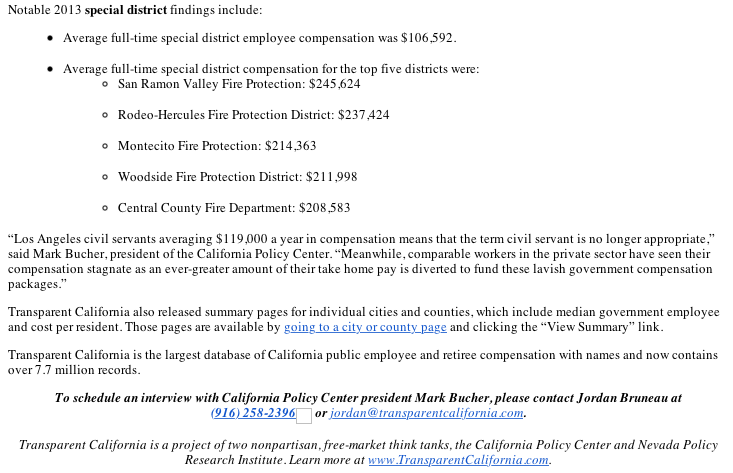 I could be wrong, but just a cursory look at transparent California tells me that benefits went down, but salaries went up. Also, many part timers who get no benefits. I guess if you're looking at previous benefits of 67,668 for 2012, that are now 61,003.00 there is a change. But salary in 2012 was 141,561. And in 2013 it was 146,302.00. Seems like a wash to me. I agree 5:45. Who knew that a little desk job in a little city would be such a sinecure? The pressure to produce is, well, as small as the town itself. I'll bet Elaine Aguilar loves Transparent California. She probably doesn't even look at it, unless someone pushes her to do it. She's too busy monitoring her investments. If we really wanted to enact reform in Sierra Madre, we would move from a "defined benefit" pension to a "defined contribution" pension. The difference is what causes some cities to go bankrupt or not. In a nutshell, a defined benefit pension means that any city council can promise the world to the public employees in terms of the pension they get when they retire. City Council members will do that to either keep the peace with the public employee unions or as payback for the public employee unions helping that city council member get elected. Nothing has to be budgeted for and the pernicious effects of such promises don't manifest themselves until long after the City Council members who made the promises are safely out of office. With a defined contribution pension, you actually have to sock the money away that you promise so that it is budgeted for each year and thus the pain of an overly generous promise will be felt during the City Council members tenure in office because if they make a big promise with the pension then they have to cut somewhere else. That's real reform. Read all about it in Steven Greenhut's book, "Plunder, How the Public Employee Unions are raiding treasuries and bankrupting Cites." Good point. The worst thing you can do is give politicians the wherewithal to barter pensions and benefits to unions in exchange for political support. That is how California got itself into close to $900 billion in pension debt. Greatest corruption spree in state history. Defined Benefit pension mean the taxpayers keep paying long after the employee leaves his/her job. Defined Contribution plans (such as 401(k) plans) on;y cost the employer (taxpayers) while the person works for the govt. Defined contribution plans are what we working stiffs in the private sector get. But government employees are special. We should show our services gratitude for however long is needed. Here's a doomsday solution. If we allow the pols to keep buying the support of govt employee unions with gargantuan pensions, they'll soon bust the trillion dollar mark and with it any chance of honoring these non-sustainable obligations. The state declares bankruptcy and voila! Problem solved. Unions are the absolute anti-christ of both the public and private sectors. Until we effectively dismantle them, we are on track to a Greece like situation, just a matter of time. My girlfriends cousin and husband are CHP, and they pulled in $245k between the two of them, and they're both in their late 30's. They're on track for a $300k/year pension when they retire at 52. I am shocked at how bad things have gotten, how much public money is wasted on giving municipal workers lavish lifestyles in retirement that most of our residents can't have. However! No unions? What, the boss/owners behave so fairly without them? Hopefully we have stopped this kind of corruption in Sierra Madre. How is that possible, 8:03? We still pay great big fat pensions, yeah? I see the possibility for reform, but actual reform financially? Not so much. Wouldn't it be fun to just start from scratch and rebuild our city government? I think that whatever we end up with would be so much better. 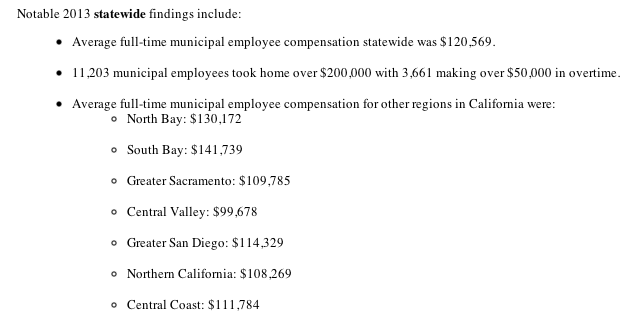 1) The city residents are proving 110+/- weekly pay checks to city employees. 2) There is No monies left over to perform infrastructure improvements! f) THE FEDERAL GOVERNMENT HAS BORROWED 77 / 1 against our US DOLLARS and can not pay it back! Lets deal with the problem now and not latter! Bust it loose, CAPS GUY! Bigger the CAP, the less the CRAP. Your points are valid and accurate, but your punctuation, spelling, and grammar are atrocious. We are grammatical Libertarians. Free to speak as we wish, free to spell that way, too. The reason for all those stodgy repressive rules in grammar is so that we can understand each other. Though I confess, I always can figure out what Caps Guy is saying. CAPS Guy is never subtle. He speaks with a firm belief in the truth of his words. Maybe they should meet and work out their differences. It is sad to read such sniping trying to pass as wit.Truly the lowest form of the art. Instead, why not make better proposals or improve those already offered ? Oh,the 'witty' ones don't have a proposal. They just like to ridicule others who try. Bullies ! Uh oh. It's a Blog Scold. If it ever stops raining I will go out and check. Where do you live, 11:03? Our water crisis is an enormous problem. One that was foreseen btw by Don Watts, when he brought up the availability of water for the large development project of the DSP, and the hillsides building. He wasn't listened to. I remember Zimmerman talking about it too. Spilt milk, and we're stuck with this inferior (maybe dangerous) water for years. Where's the Build 'Em Big troll today? Maybe s/he finished the hours s/he had been paid for. They already gave him his six pack and a fist full of Slim Jims. in a city where our police force actually doesn't do much as far as actual policing, how can an officer make $30,000 in overtime?